Home » bicycle safety » Can Hartford Learn from Cities Like Madison, WI? Remember to support BiCi Co’s Fall 2016 Membership and Fundraising Campaign. We can’t do this without you! 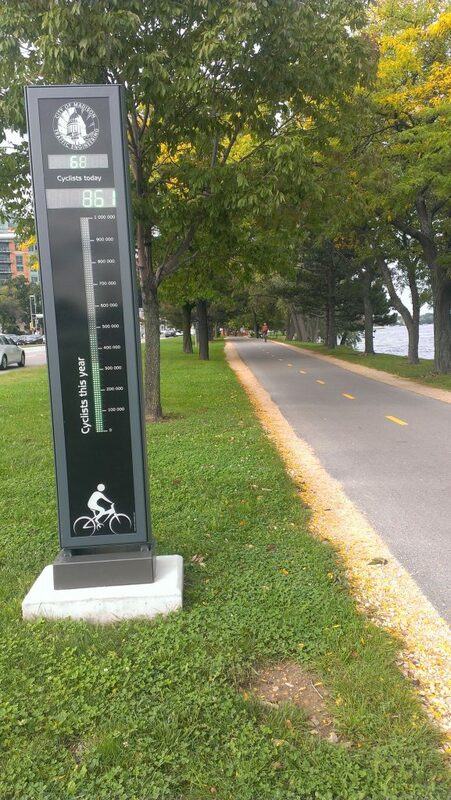 A real time counter along the multi-use path counts usage. 861 users at mid-day with drizzly weather. This is Tony C. Dropping in with some thoughts from the BiCi Tour. 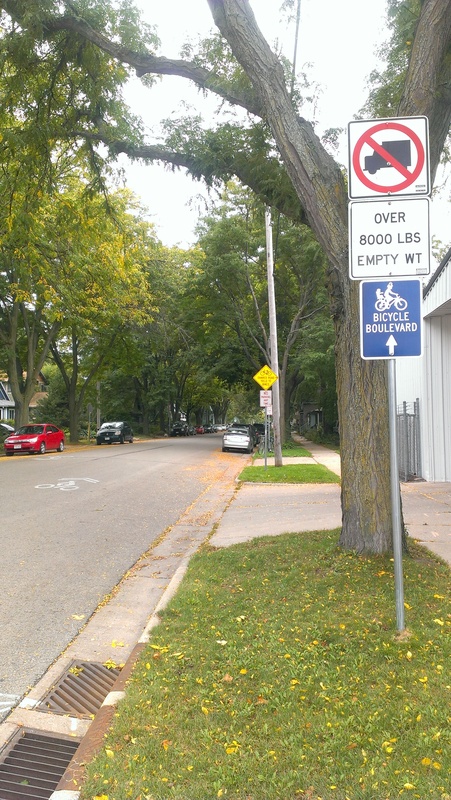 I landed in Madison, Wisconsin yesterday and found myself in a magical land of bustling urban development, bicycle infrastructure, and feet on the street. This tour has given me opportunities to directly experience a large number of cities, large and small. My ride is a bit of a national survey and observation of infrastructure advances relative to Complete Streets. I am trying to learn something from the cities that have done it wrong, and learn even more from those that have done it right. There is a handful of cities that I planned to stay an extra day in to get a more complete survey. Madison is rightly one of those cities. The photos may speak for themselves. 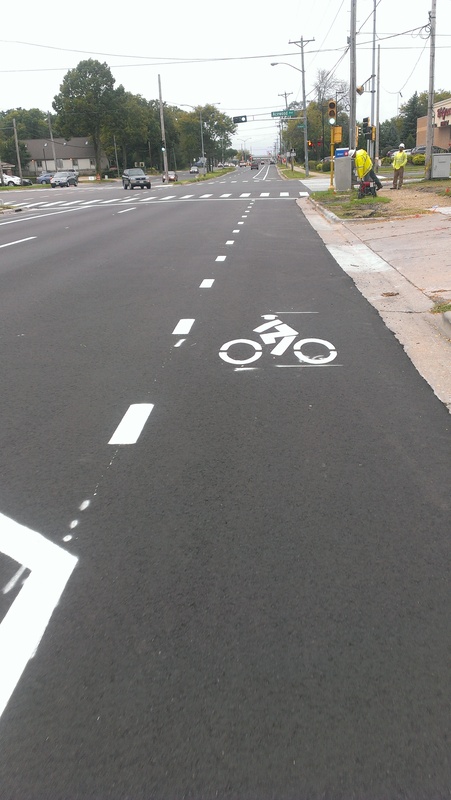 A buffered bike lane on a state highway into town transitions to dashed lines at the intersections. Well executed design. Hartford is at an interesting crossroads (or pivot) in our shared path. After decades of disinvestment and treatment as a daytime, work-only destination by our suburban and exurban friends there are plans and policies taking shape to change that formula. The full rewrite of our zoning code to reduce parking requirements (and in some zones remove them) lowers the cost of new developments, especially Downtown. The zoning chapter on Complete Streets (Chapter 9) includes an aspirational bicycle route map (pg 248) and provides a framework of road cross sections and treatments that begin to balance the mobility and safety of walking and bicycling residents with the speedy desires of suburban car commuters. 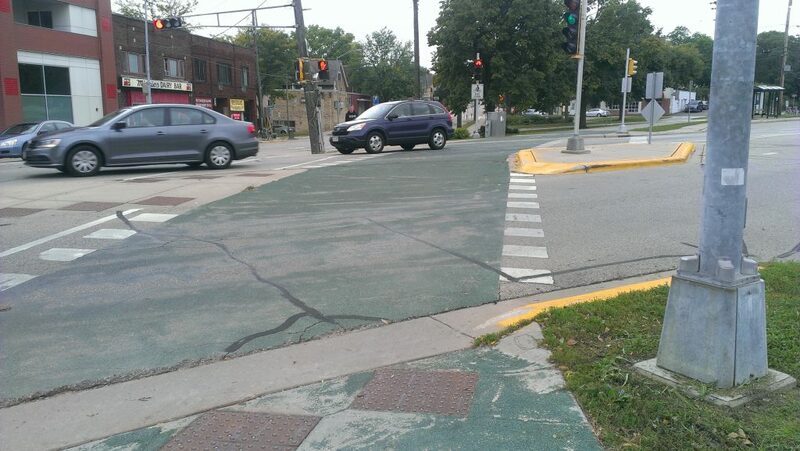 The bikeway has button triggered signals where it crosses busy roads. Strong schools with a path to employment in our local economy whether or not the student chooses to attend college. Losing High School Inc. (planned re-absorption into Weaver) with its connection to downtown insurance companies and internships is not a step in the right direction. Laying off 100 teachers is not a step in the right direction. Job training and local hiring for construction and infrastructure projects, with a path to higher skilled and management jobs within those industries. With the massive I-84 project coming to Hartford, we have to insist that the training and local hiring be requirements to bolster our local economy during the very inconvenient construction process. Infrastructure projects, bicycle share, and education that put residents and neighborhoods high on the list when considering investments. These are the existing users of active transportation (for necessity), and the investments must reflect that. High school (and younger) engagement and involvement in urban design, transportation, and infrastructure topics. Part of the economic benefit of active transportation is choosing it even when you might be able to “jump” to the next level in the expensive food chain. Helping youth and teens explore those topics provides a counter narrative to the social pressure and automobile advertising that pushes them toward car-centric living. The Center for Latino Progress and BiCi Co. have been able to reach a significant number of Hartford teens with these topics through our Summer Youth Employment internships and Earn-a-Bike programs. And now – more pictures of magical Madison, Wisconsin. 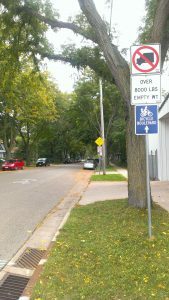 Stay tuned for a similar post on Minneapolis, which may border on European-level human scale infrastructure and usage. 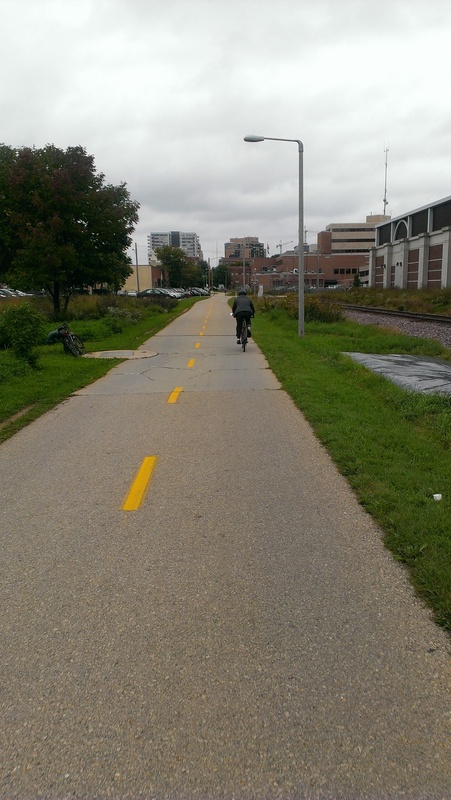 The Capital City Trail through Madison transitions to a bicycle boulevard for a couple of blocks. A fellow riding to a meeting or work in a full suit with jacket. Families riding bikes, even in the city center. 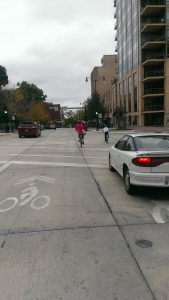 The higher bicycle mode share changed the behavior of drivers. 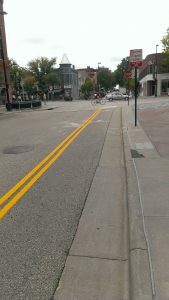 A version 2.0 counter flow bike lane on a one way street for cars, with dedicated signals at the intersections. Bike lanes even out on the edge of the city. 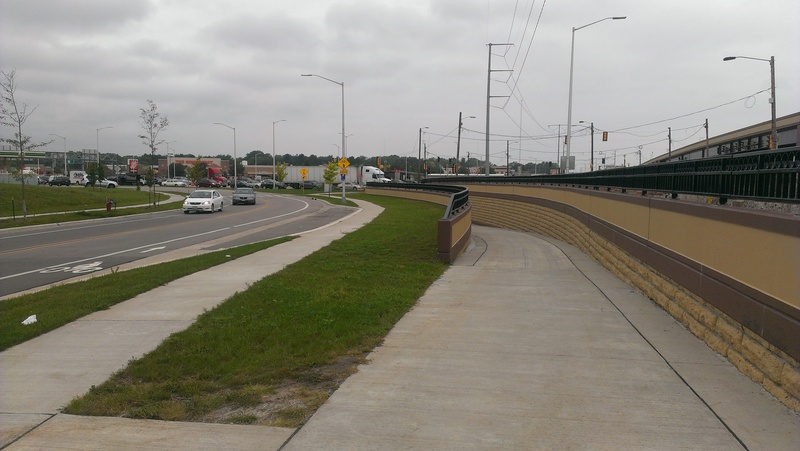 This tunnel goes underneath a busy state road, much safer than an at grade crosswalk.